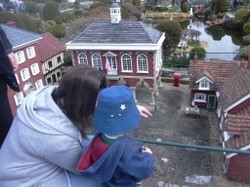 Bekonscot is the oldest and in my opinion most beautiful model village in the world. It has been run by the Church Army since 1978. Bekonscot was first created by Roland Callingham in the 1920s. Its name is an amalgam of the village Beaconsfield and Ascot. It has been the setting of many UK television shows and children's author, Enid Blyton lived in Beaconsfield and knew the model village well. We visited with our 2 year old grandson recently and he loved it, especially the train sets running round the site. This place appeals to young and old alike. The owners claim that it is stuck in a time warp. Come and see England like it used to be. This photo view gives a quirky glimpse of a time sadly lost and a visit gives a warm glow of nostalgia. As we step back into the past so immersed are we that, at times it is hard to believe that this is a model. Of course no typical English village is complete without its market and maypole dancers ( above ) . The buildings and sets at Bekonscot are based around a typical 1930's South of England village. There are several little sets around the site including a miniature aerodrome, a castle, an archaeological dig and more. As a child the Queen and her young sister Princess Margaret- Rose visited the site. Every attention is paid to exact detail to ensure total accuracy. Trains figure highly at Bekonscot. There is a light railway where visitors can take a little trip round the site. But there are also miniature trains and carriages running constantly round the village settings. Everything is scaled to perfection. The red van ( below ) is a great example of this attention to scale and detail. The beauty of this place is that visitors are allowed to get so close to the exhibits. This makes it a more engaging attraction. I really liked the miniature lighthouse. As previously stated on Wizzley, I love lighthouses and this harbour set made a charming scene. The little bi-planes are an amusing feature of the airfield. The model horses aren't just on the track, they are also in the paddock for a touch of authenticity. If you get a chance to visit Bekonscot in Buckinghamshire, please do so. You won't be disappointed. The miniature buildings are empty inside but the windows are made with glass. I have never seen a better model village ; it is delightful and enchanting. it is loved by all age groups and that is the measure of the place. Veronica, Are the building windows really glass? Can one see through them? Is there anything inside or is the castle, for example, empty inside? The upkeep indeed must be impressive, particularly in regard to all the well-groomed shrubs, trees and vines. Hello. Yes I thought of you especially and that is why I added the lighthouse picture for you when I was choosing. I wondered if you would notice. Imagine the detail of a miniature lighthouse. Bekonscot is enchanting. The attention to detail is superb and being there with a two year old who was running about shouting for me to catch up and see something new was a precious time. How lovely to still be of an age where everything is still new to us. If you get to England I hope you have a chance to visit Bekonscot. What a wonderful day this must have been to share with your grandson. I wsas intrigued by the photos of the maypole dance, the inside of the castle, and of course, the harbor with the lighthouse. Ty for the comments. I think a person's enjoyment always shows through a photo. It is an enchanting place regardless of age. I have visited it with a 80 yr old and a 2 yr old and they have loved being there. My Daughter in Law was enthralled. It is the best model village I have visited and it is the attention to detail to makes it so special. Plus it gives a comforting taste of stepping back in time to how things were. It would be just less than $15 USA for an adult to enter. about £10 UK But considering the maintenance and work involved that is a fair price I think. This place looks magnificent. And, I see the images have your name attached. Nice photography work. Thank you. It is an enchanting time spent. Bekonscot village looks quite lively and full of activity. The photos do convey the message.